This bedtime boost treats nails and cuticles to hydration with nutrient-rich actives, all in one luxe formula. It’s time for a nail intervention! Flawless color laydown starts with healthy, moisturized nails. Overnight moisturizing treatments work wonders for skin and hair, and now nails and cuticles can benefit from the rejuvenating results. Introducing Sally Hansen Moisture Rehab™, our first overnight nail serum that contains moisture and nutrient rich extracts for intense nail and cuticle restoration. This brush-on, luxurious formula, featuring a blend of black orchid, açai and algae actives and humectants, helps hydrate and rejuvenate severely dry or weak nails. The lightweight, serum formula leaves nails ready for rest and repair, so you can awaken to stronger, replenished and healthier-looking nails and cuticles. “Based on my expertise, Moisture Rehab is a great product for delivering moisturization overnight to address issues of dryness and dehydration. This improves the overall manicure, enhancing smooth color laydown, increasing nail flexibility to avoid chipping and making the finished product more beautiful,” says Madeline Poole, Sally Hansen Global Color Ambassador. 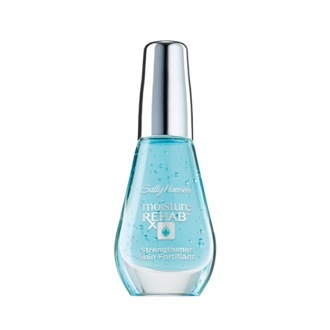 Price & Availability: Sally Hansen Moisture Rehab™ Overnight Nail Serum will be available January 2017 for $9.99 at drugstores nationwide.